First make the crust. Put the cookies into the bowl of a food processor and process until completely smooth. Add the butter and pulse to combine well. Lightly spray a 9x9 square baking pan, and line with parchment if you want to be able to remove it for easy cutting later. Press the cookie crumb mixture evenly into the bottom of the pan, taking a few minutes to really tamp it down and get it even. I like to use my offset spatula to get the edges neat and even. Refrigerate. Put the chocolate chips or chopped confectionery into a microwave safe bowl and microwave on high for one minute. Remove and stir to melt the chocolate. If there are still lumps, give it 15 more seconds and try again. Don't over heat or the chocolate can seize up and be ruined. Once it is smooth, set it aside to cool briefly. Meanwhile whip the cream until soft peaks form. Set aside. 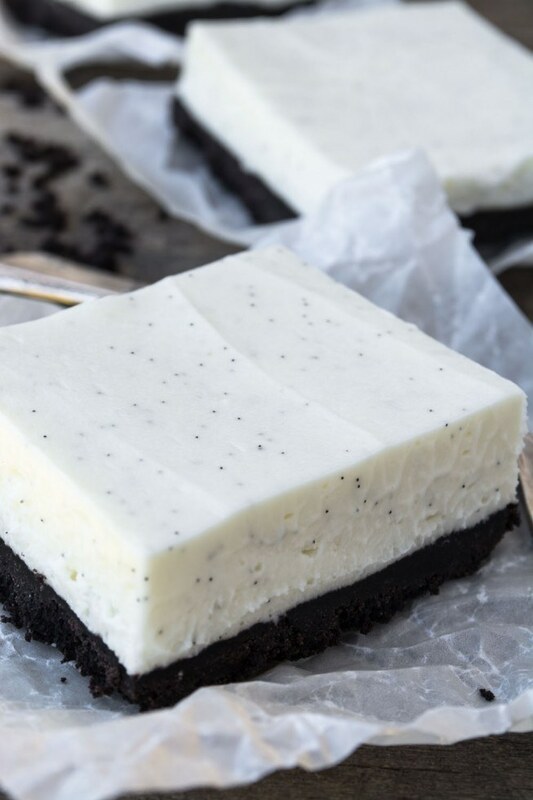 Blend the room temperature cream cheese together with the melted chocolate and the vanilla bean seeds. Keep blending until smooth. Then fold in the whipped cream, and keep blending until that is smooth. You may need to whisk or beat it very briefly to get it all incorporated. Spread the mixture over the crust, evening it out from side to side. Put the pan back in the refrigerator until fully chilled, about 3 hours, or overnight. Cut into squares, Store in the refrigerator.